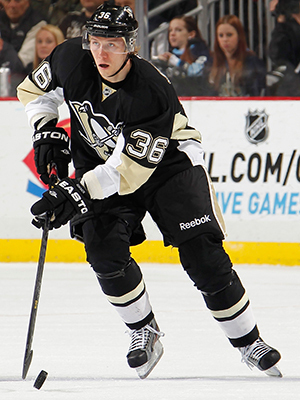 The Penguins host the Carolina Hurricanes on Saturday at CONSOL Energy Center for their regular season finale. It’s been a disappointing year for the Hurricanes, who missed the playoffs for the sixth time in the past seven seasons and 10th time in 15 seasons in North Carolina. Though Pittsburgh has played Carolina twice already, Saturday’s finale will be Jordan Staal’s first game back in Pittsburgh since being traded to the Hurricanes last summer. Staal didn’t have the season he wanted in Carolina, especially coming off a career year with Pittsburgh last year. He’s scored 10 goals (including his first in 12 games on Tuesday in a shootout win over the Islanders), but overall his production has been inconsistent while his minus-17 rating is one of the team’s worst. However, he does come into Saturday with eight points in his last 10 games and he’ll likely be pumped to play in front of his former home crowd. There may be another J. Staal in the lineup Saturday, as the Hurricanes called up youngest Staal brother Jared from the team’s American Hockey League affiliate to join Jordan and Eric. Jared made his NHL debut on Thursday against the Rangers (the fourth and final Staal brother Marc’s team), skating on a line with Jordan and Tuomo Ruutu. Eric, Jordan and Jared became the 10th trio of brothers in North America’s four major pro sports leagues – and fourth in the NHL – to play for the same team in the same season, according to STATS LLC. Head coach Kirk Muller announced before Thursday’s game that winger Alex Semin has a concussion and would miss that game and Saturday’s game as well. 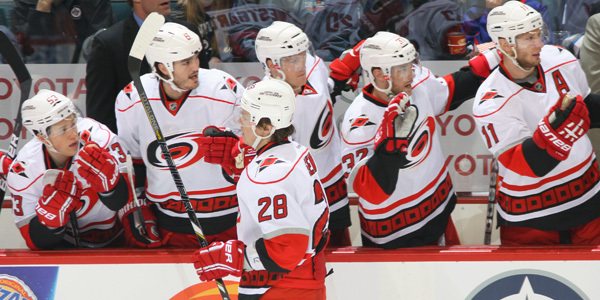 With Semin out, Chad LaRose slotted in on the first line with Eric Staal and Jiri Tlusty. Tlusty is having a career season in his fourth with the Hurricanes and sixth overall. He carried a six-game point streak into Thursday’s game, where he’s totaled four goals and eight points in that stretch. The former first-round pick leads the team with a personal-best 21 goals (his previous high was 17, set last season through 79 games). 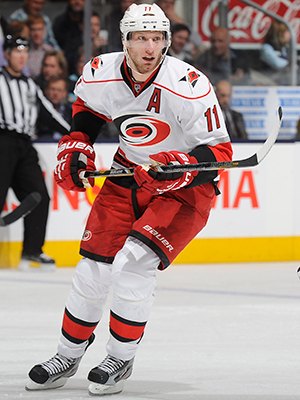 And Hurricanes captain Staal has been productive as ever, with 50 points (18G-32A) in 46 games. He brings a three-game point streak into Saturday. Goalie Cam Ward remains out after suffering a third-degree MCL sprain in his left knee on March 3 at Florida. He has missed 26 games. Justin Peters appeared in eight straight games for Carolina earlier this month (including April 9 vs. Pittsburgh), but Dan Ellis has since started the last three. Of course we have to go with Jordan Staal for his first game back in Pittsburgh since being traded to Carolina at last year’s NHL Draft. It’s sure to be an emotional evening for Staal, who was drafted second overall by Pittsburgh in 2006 and spent the first six seasons of his career here – winning the Stanley Cup in 2009. I would expect to see a big game from him. He hasn’t had the season he wanted, but he does have eight points (2G-6A) in his last 10 games – including a two-point performance (1G-1A) in a shootout win over the Islanders on Tuesday – and leads the Hurricanes with 104 hits. The Hurricanes put Jussi Jokinen on waivers in March; then traded him to the Penguins at the deadline for a conditional 2013 draft pick. With an influx of injuries, the Penguins immediately relied on Jokinen to step up in a big role for them – and he delivered. Jokinen, who scored a power-play goal on Thursday against New Jersey, has five goals and nine points in nine games with the Penguins. He’s been dominant in the faceoff circle and clutch in the shootout. Jokinen has been big for Pittsburgh since arriving here; expect him to bring all of that on Saturday against his former team as the Penguins prepare for the playoffs. - The Penguins wrap up the regular season against the Carolina Hurricanes at CONSOL Energy Center. - The Penguins have won their final home game of the season nine straight years entering Saturday’s game. - Pittsburgh has won its final regular-season game regardless of location four straight years entering Saturday. - Pittsburgh enters Saturday’s game having gone 22-4 in its last 26 games. - Pittsburgh is 7-3 in its last 10 games overall against the Hurricanes. - The Penguins have won four straight games against the Hurricanes in Pittsburgh and they are 7-2-1 in the last 10 meetings here. Saturday marks Jordan Staal’s first visit to Pittsburgh since he was dealt to the Carolina Hurricanes at the 2012 NHL Draft on June 21, 2012. Staal, the first-ever draft pick made by GM Ray Shero in 2006, finished his Penguins career with 248 points (120G-128A) in 431 regular-season games. He had 36 more points (23G-13A) in 73 playoff games. He helped the Penguins win the Stanley Cup in 2009, with his shorthanded goal in Game 4 of the Final arguably the most-pivotal tally of the series. Staal was a finalist for the Calder Trophy in 2006-07 and the Selke Trophy in ’09-10. *Made his NHL debut against Philadelphia on Oct. 5, 2006. *Became the youngest player in NHL history to score two shorthanded goals in the same game and to score on a penalty shot vs. Columbus on Oct. 21, 2006. *Scored the Penguins’ final goal ever at Mellon Arena in Game 7 against Montreal on May 12, 2010. *Scored his 100th NHL goal against New Jersey on Oct. 22, 2011. The Penguins enter Saturday’s game with 17 home wins – second-most in the NHL. Pittsburgh has gone 14-2 in its last 16 home games entering tonight –with the two losses both coming to the Buffalo Sabres. The last team to defeat the Penguins at home other than Buffalo was the Philadelphia Flyers (6-5) on Feb. 20. Since the beginning of the 2011-12 season, the Penguins lead the NHL with 46 home wins. During that stretch they have gone 46-16-2 (.734 pct.). Pittsburgh’s penalty kill has successfully killed off 16 of 19 times shorthanded (84.2%) over the last five games entering Saturday. At home, the Penguins have gone eight straight games without allowing a power-play goal – a span of 21-straight kills. The Penguins have been perfect on the penalty kill in 11 of their last 14 home games (33-for-36; 91.7%). Pittsburgh’s power play has gone 10-for-33 (30.3%) over its last seven games. During that stretch the Penguins have scored at least once on the man-advantage in six of the seven games. Jarome Iginla has scored three power-play goals in his last five games. During the month of April, Iginla’s four power-play tallies are tied with Alex Ovechkin for most in the NHL. Iginla ranks sixth (tied) among all NHL players with six power-play points this month (4G- 2A). Sidney Crosby participated in his first team practice in nearly a month Friday afternoon at Southpointe. He will not play in the Penguins’ Saturday regular season finale against Carolina and there is no timetable for a return to game action. Full update here. Penguins coach Dan Bylsma announced following Friday's practice that defenseman Paul Martin and winger James Neal will return to the lineup for the regular-season finale on Saturday vs. Carolina. Full update here. Brooks Orpik and Joe Vitale remain day-to-day with lower-body injuries. Neither player participated in Friday's practice, but Vitale did have a 1-on-1 on-ice session with strength and conditioning coach Mike Kadar before the team skate.